Thank you everyone for your submissions!!! We understand that everyone is currently busy wrapping up their academic work. 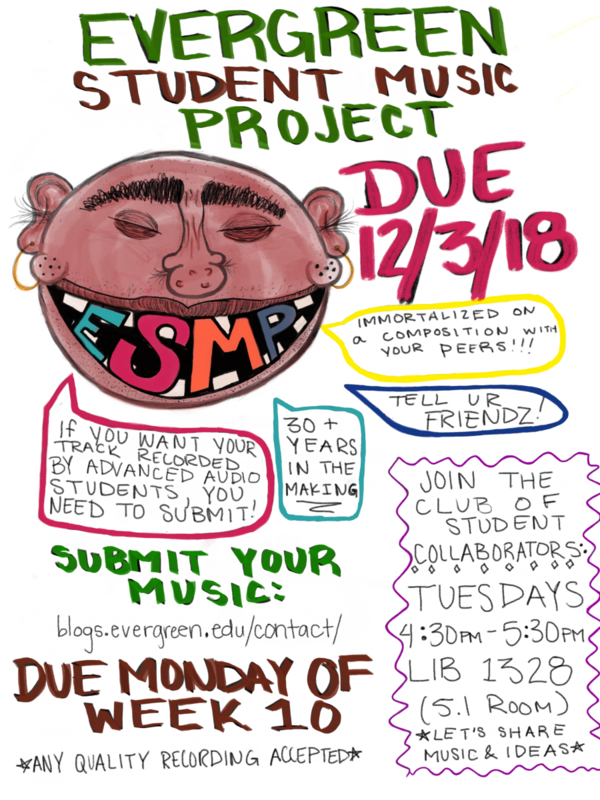 Because of this, we are postponing today’s meeting until the first Tuesday of winter quarter (January 8th) to listen to all the submissions and make final selections for the ESMP. If you haven’t yet, this is your last chance to submit your music for consideration. We hope to see you there and have a great winter break. 0 Fall 2018- First Update!!! 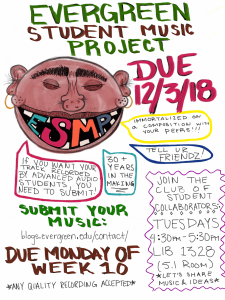 We are now accepting submissions for the 2018-19 ESMP!!!! You can submit demos of your music via the ‘SUBMIT!’ tab on this site for a chance to have it re-recorded in the multitrack studios on campus. Submissions are due Monday of week 10 (12/3/18). The recording quality of your submission will have no bearing on whether or not it is accepted, but you do need to submit either an mp3 or WAV file; if you are unable to submit an mp3 or WAV file you can use the ‘SUBMIT!’ page to contact us without attaching a file. Please let us know if you are interested in performing your music live as we may be hosting a concert later in the school year. We are looking forward to hearing your music! Currently we plan to have meetings on Tuesdays at 4:30pm. Please come if you would like to be a more involved member of the project. We will be sifting through submissions together, sharing music and ideas, and planning for the future. Happy middle of the quarter! Keep doing good work and making cool music!